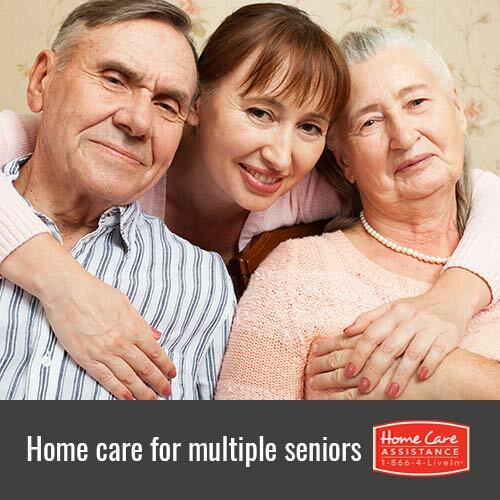 Can You Provide Home Care for More Than One Senior? Families can face some tough decisions when several elderly loved ones need assistance at the same time. Whether you are hoping to keep your aging parents in their home or you have several loved ones who need assistance, here are some things to consider when planning their care. Will They Stay in the Same Place? One of the first things you will need to decide is where your loved ones will be living. Providing care to multiple seniors who live in the same home is easier than having to drive back and forth between two different locations. If your loved ones will be sharing a home, then you will also need to ensure the living space has the proper accommodations to meet their needs such as a restroom located near the sleeping area. Do They Have Similar Needs? Varying levels of independence can affect the ability to provide quality care to more than one senior at once. If your loved ones are fairly independent, then providing family home care can be relatively simple. However, you may still need support from other caregivers in Guelph if one or more of your loved ones has a serious health condition that limits the ability to perform daily routines. Family caregivers often start out with the best intentions of providing home care in Guelph for their loved ones, and it is common for other members of the family to gradually become busy with other responsibilities. For this reason, it is important to create a clearly defined outline for support at the very beginning. Hold a family meeting and identify who will be responsible for meeting the specific needs of each loved one. If necessary, seek professional support such as transportation or meal services to ensure no need goes unaddressed. How Will You Prevent Caregiver Burnout? Providing home care for one loved one can be stressful, and the stress may increase with each additional loved one who needs care. While it is possible to provide home care to more than one senior at a time, it is also essential to plan for caregiver relief. Guelph respite care is an option that should be considered so you can have an opportunity to take care of your health and enjoy some relaxation. A solid network of support benefits seniors, especially when several in a family are in need of care. If caring for more than one elderly loved one becomes too overwhelming, let a professional caregiver from Home Care Assistance step in to help. Our caregivers are available 24/7 to assist with a wide variety of tasks, including cooking, bathing, cleaning, and exercise. For more information on our senior care services, call one of our experienced Care Managers at (519) 954-2111 to schedule a no-obligation consultation.